Oswego County is a county in the U.S. state of New York. As of the 2010 census, the population was 122,109. The county seat is Oswego. The county name is from a Mohawk language word meaning "the outpouring", referring to the mouth of the Oswego River. Oswego County is part of the Syracuse, NY Metropolitan Statistical Area. 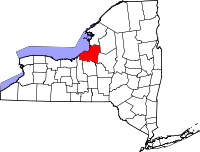 When counties were established in the British colony of New York in 1683, the present Oswego County was part of Albany County. This was an enormous county, including the northern part of what is now New York state as well as all of the present state of Vermont and, in theory, extending westward to the Pacific Ocean. This county was reduced in size on July 3, 1766 by the creation of Cumberland County in the British colony, and further on March 16, 1770 by the creation of Gloucester County, both containing territory now in Vermont. On March 12, 1772, what was left of Albany County was split into three parts, one remaining under the name Albany County. One of the other pieces, Tryon County, contained the western portion (and thus, since no western boundary was specified, theoretically still extended west to the Pacific). The eastern boundary of Tryon County was approximately five miles west of the present city of Schenectady, and the county included the western part of the Adirondack Mountains and the area west of the West Branch of the Delaware River. The area then designated as Tryon County now includes 37 counties of New York State. The county was named for William Tryon, colonial governor of New York. In the years prior to 1776, most of the Loyalists in Tryon County fled to Canada. In 1784, following the peace treaty that ended the American Revolutionary War, the name of Tryon County was changed to Montgomery County to honor the general, Richard Montgomery, who had captured several places in Canada and died attempting to capture the city of Quebec, replacing the name of the hated British governor. In 1789, the size of Montgomery County was reduced by the splitting off of Ontario County from Montgomery. The actual area split off from Montgomery County was much larger than the present county, also including the present Allegany, Cattaraugus, Chautauqua, Erie, Genesee, Livingston, Monroe, Niagara, Orleans, Steuben, Wyoming, Yates, and part of Schuyler and Wayne counties. Oswego County was partly in Macomb's Purchase of 1791. In 1791, Herkimer County was one of three counties split off from Montgomery (the other two being Otsego, and Tioga County). This was much larger than the present county, however, and was reduced by a number of subsequent splits. In 1794, Onondaga County was created from a part of Herkimer County. This county was larger than the current Onondaga County, including the present Cayuga, Cortland, and part of Oswego counties. In 1798, Oneida County was created from a part of Herkimer County. This county was larger than the current Oneida County, including the present Jefferson, Lewis, and part of Oswego counties. In 1805, Oneida County was reduced in size by the splitting off of Jefferson and Lewis counties. In 1816, Oswego County was created as New York State's 48th county from parts of Oneida and Onondaga counties. In 1841, businessmen in Oswego attempted to divide Oswego County into two counties. They failed to persuade the State to do so, however. Occasionally, the topic still comes up today by dividing the county into an east part and a west part, with the east portion being renamed "Salmon County". At various times, beginning in 1847 and as late as 1975, attempts were made to move the county seat to the Village of Mexico. However, none of these attempts succeeded. On April 20, 2002, around 6:50 am, many residents of Oswego County were shaken awake by a magnitude 5.2 earthquake centered near Plattsburgh, New York. Minor damage to a Fire Hall in Altmar was the only report of damage. No injuries were sustained. During 1–12 February 2007, a major lake effect snowfall dumped over ten feet of snow in many places in Oswego County, resulting in several roof collapses, some communities being cut off, and some people being snowed-in in their homes. A state of emergency was declared for the county, and the National Guard was sent in to help clear the snow. The Oswego County legislature has 25 members, elected from equal population districts, reduced from 36 in 1993. According to the U.S. Census Bureau, the county has a total area of 1,312 square miles (3,400 km2), of which 952 square miles (2,470 km2) is land and 360 square miles (930 km2) (27%) is water. Oswego County is in northwestern New York State, just north of Syracuse and northwest of Utica, on the eastern shore of Lake Ontario. Part of the Tug Hill Plateau is in the eastern part of the county and, at 1,550 feet (470 m), is the highest point. The Salmon River Falls, a 110-foot (34 m) waterfall, is a popular sightseeing destination in the northeastern portion of the county. There are two harbors in the county, Oswego Harbor at the mouth of the Oswego River and Port Ontario on the Salmon River. The first major port of call on the Great Lakes is the Port of Oswego Authority dock. As of the census of 2000, there were 122,377 people, 45,522 households, and 31,228 families residing in the county. The population density was 128 people per square mile (50/km²). There were 52,831 housing units at an average density of 55 per square mile (21/km²). The racial makeup of the county was 97.17% White, 0.59% Black or African American, 0.41% Native American, 0.42% Asian, 0.01% Pacific Islander, 0.48% from other races, and 0.93% from two or more races. Hispanic or Latino of any race were 1.30% of the population. 15.5% were of Irish, 14.0% German, 13.7% Italian, 13.3% English, 9.6% American, 7.9% French and 5.3% Polish ancestry according to Census 2000. 96.2% spoke English and 1.7% Spanish as their first language. There were 45,522 households out of which 35.00% had children under the age of 18 living with them, 52.80% were married couples living together, 10.80% had a female householder with no husband present, and 31.40% were non-families. 24.30% of all households were made up of individuals and 9.70% had someone living alone who was 65 years of age or older. The average household size was 2.60 and the average family size was 3.08. In the county, the population was spread out with 26.80% under the age of 18, 10.90% from 18 to 24, 28.90% from 25 to 44, 22.10% from 45 to 64, and 11.30% who were 65 years of age or older. The median age was 35 years. For every 100 females there were 97.50 males. For every 100 females age 18 and over, there were 94.40 males. The median income for a household in the county was $36,598, and the median income for a family was $43,821. Males had a median income of $34,976 versus $23,938 for females. The per capita income for the county was $16,853. About 9.70% of families and 14.00% of the population were below the poverty line, including 17.10% of those under age 18 and 9.50% of those age 65 or over. Oswego County is also home to two colleges: State University of New York at Oswego in the Town of Oswego and the Fulton Branch Campus of Cayuga County Community College in the City of Fulton. Oswego County has 22 towns, 2 cities, and 10 villages. Taft Bay Park at Bernhards Bay, New York and other swimming on Oneida Lake. Oswego County includes the majority of the northern shore of the lake, running east to the hamlet of Cleveland, New York. It also includes all of the lake surface from the north shore to the south shore, which is the northern edge of Onondaga and Madison counties. So swimming out from beaches on the southern shore, even, puts you in Oswego County. Oswego County runs east along the south shore almost to the hamlet of Lakeport. ^ a b "State & County QuickFacts". United States Census Bureau. Archived from the original on July 16, 2011. Retrieved October 12, 2013. ^ White, Shannon. "Oswego County Legislature". oswegocounty.com. Retrieved 2016-08-10. ^ "2010 Census Gazetteer Files". United States Census Bureau. August 22, 2012. Archived from the original on May 19, 2014. Retrieved January 6, 2015. ^ Minetor, Randi (2014). Hiking waterfalls in New York: a guide to the state's best waterfall hikes. Guildford, Conn.: Falcon Guides. pp. 67–69. ISBN 0762787503. Retrieved 20 February 2015. ^ "U.S. Decennial Census". United States Census Bureau. Retrieved January 6, 2015. ^ "Historical Census Browser". University of Virginia Library. Retrieved January 6, 2015. ^ "Population of Counties by Decennial Census: 1900 to 1990". United States Census Bureau. Retrieved January 6, 2015. ^ "Census 2000 PHC-T-4. Ranking Tables for Counties: 1990 and 2000" (PDF). United States Census Bureau. Retrieved January 6, 2015. ^ a b c d e f g h i "Visit Oswego County's Beaches and Pools". visitoswegocounty.com. ^ a b c d e f "Oswego County Division of Promotion and Tourism: Swimming". oswego.ny.us. ^ "Quickfacts: Oswego County, New York". U.S. Census Bureau. 1 July 2017. Retrieved 6 November 2018. Wikimedia Commons has media related to Oswego County, New York.